Reference your UFO Study: You probably already have this item in your file, but in case you don't I will briefly outline it + you can contact me for full details if you want them. I retired (20 years Service) 1 April 67 from the USAF. I have placed my Name Rank + Serial No. at top of page if you want to check on my authenticity. I was an Air Traffic Controller thruout my service Career and utilized Radar the last 16 years in the Control of Air Traffic. I won't bother listing the types and locations altho I could supply all this if needed. I have never mentioned this incident as I was pretty sure it is considered (or was) Classified and the only reason I feel free to give you details is because you are an official Government Agency. In 1956, sometime between Jan. + Sept (Can't remember exact date or Month.) I was on duty as Watch Supervisor at Lakenheath RAF Station England (a USAF Base) in the Radar Air Traffic Control Center. It was the 5:00 PM to MIDNITE shift. I had either 4 or 5 other Controllers on my shift. I was sitting at the Supervisor's Coordinating desk + received a call on the direct line (Can't remember which line it was) Anyway - it was Sculthorpe GCA Unit calling and the Radar Operator asked me if we had any targets on our scopes travelling at 4,000 mph. They said they had watched a target on their scopes proceed from a point 30 or 40 miles East of Sculthorpe to a point 40 miles West of Sculthorpe. The target passed directly of over Sculthorpe RAF Station, England - (also USAF Station). He said the tower reported seeing it go by and just appeared to be a blurry light. A C-47 flying over the base at 5,000 feet Altitude also reported seeing it as a blurred light that passed under his aircraft - No report as to actual distance below the aircraft. I immediately had all Controllers start scanning the Radar scopes. I had each Scope set on a different range - from 10 miles to 200 miles radius of Lakenheath. At this time I did not contact anyone by telephone as I was rather sceptical of this report. We were using full MTI on our radar which eliminated entirely all ground returns + Stationary targets. There was very little or no traffic or targets on the scopes as I recall. However, one controller noticed a Stationary target on the scopes about 20 to 25 miles Southwest. This was unusual as a stationary target should have been eliminated unless it was moving at a speed of at least 40 to 45 Knots. And yet we could detect no movement at all. We watched this target on all the different scopes for several minutes + I called the GCA Unit at Lakenheath to see if they had this target on their scopes also - they confirmed the target was on their scope in the same geographical location. As we watched the stationary target started moving at a speed of 400 to 600 miles per hour in a North, Northeast direction until it reached a point about 20 miles North Northwest of Lakenheath. There was no slow start or buildup to this speed - it was constant from the second it started to move until it stopped. I called and reported all the facts to this point, including Sculthorpe GCA's initial report, to the 7th AIR DIVISION Command Post at London. They in turn notified 3rd Air Force Command Post and had them hooked into the same line, 3rd Air Force Command Post had their Commander (a General but I can't remember his name) hooked into the line, I also hooked in my local AFB Commanding Officer [Colonel Ellery D. Preston] and my Unit (AACS Communications Squadron) Commander [Captain William C. Wilson or Captain Harold J. Millington], on my switchboard. And there could have been others hooked in also that I was not aware of. I repeated all the facts known to this point and continued to give a detailed report on the target's movements and location. The interceptor aircraft took off from an RAF Station near London and approached Lakenheath from the South West. Radio + Radar Contact was established with the RAF Interceptor Aircraft at a point about 30 to 35 miles southwest of Lakenheath inbound to Lakenheath. 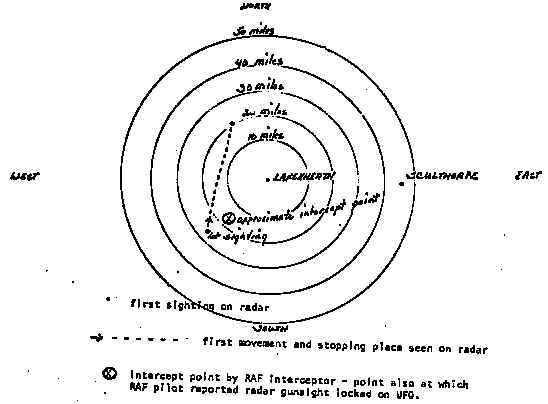 On Initial Contact we gave the interceptor pilot all the background information on the UFO, his (the interceptor) present distance and bearing from Lakenheath, the UFO (which was stationary at the time)'s distance and bearing from Lakenheath. We explained we did not know the Altitude of the UFO but we could assume his altitude was above 1,500 feet and below 20,000 feet due to the operational characteristics of the radar (CPS-5 type radar I believe). Also we mentioned the Report from the C47 over Sculthorpe that mentioned the light passed below him and his Altitude was 5,000 feet. "Where did he go? Do you still have him?" We replied "Roger, do you have anything following you?" He said "Roger, do you have anything following me?" We replied "Roger, it appeared he got behind you and he's still there." There were now 2 targets one behind the other, same speed, very close, but 2 separate distinct targets. The first movement by the UFO was so swift (Circling behind the intercept) I missed it entirely but it was seen by the other controllers. However the fact that this had occurred was confirmed by the Pilot of the Interceptor. The pilot of the interceptor told us he would try to shake the UFO and we'de try it again. He tried everything - he climbed, dived, circled etc but the UFO acted like it was glued right behind him, always the same distance, very close but we always had 2 distinct targets. (NOTE: Target resolution on our radar at the range they were from the antenna (about 10 to 30 miles all in the southerly sectors from Lakenheath) would be between 200 + 600 feet probably. Closer than that we would have got one target from both aircraft + UFO. Most specifications say 500 feet is the minimum but I believe it varies and 200 to 600 feet is closer to the truth and also I believe the tuning of the equip. Atmospheric Conditions etc also help determine this figure also. The interceptor pilot continued to try +shake the UFO for about 10 minutes (approximate guess - it seemed longer both to him + us). He continued to comment occasionally and we could tell from the tonal quality he was getting worried, excited and also pretty scared. He finally said "I'm returning to Station, Lakenheath. Let me know if he follows me. I'm getting low on petrol." The target (UFO) followed him only a short distance as he headed South South West and the UFO stopped and remained stationary. We advised the interceptor [that] the UFO target had stopped following him and was now stationary about 10 miles south of Lakenheath. He rogered this message and almost immediately the 2nd Interceptor called us on the same frequency. We replied and told him we would advise him when we had a radar target so we could establish radar contact with his aircraft (He was not on radar at this time, probably had just taken off and was too low for us to pick him up or too far away - we had most of the scopes on short range so we could watch the UFO Closely on the smaller range. The #2 Interceptor called the #1 Interceptor by name (Tom, Frank - whatever his name was) and asked him, "Did you see anything?" #1 replied "I saw something but I'll be damned if I Know what it was." #2 said "What happened Jim?" #1 [replied] "He (or it) got behind me and I did everything I could to get behind him and I couldn't. It's the damndest thing I've ever seen." #1 also made a remark at this time to #2 that he had his Radar :ocked on whatever it was for just a few seconds so there was something there solid. Then #1 switched frequencies to his home Base Frequency. We gave #2 the location of the UFO and advised him we still didn't have him on radar but probably would have shortly. He delayed answering for some seconds then finally said - "Lakenheath (------- Identification A/C CALL SIGN, can't rember remember what call sign of these aircraft were). Returning to home Station, My Engine is Malfunctioning." He then left our frequency. Thruout this we kept all the agencies, 7th AD, 3rd Air Force, etc advised on every aspect - every word that was said - everything. We now then enquired what action they wanted us to take. They had no more suggestions and finally they told us to just keep watching the target and let us know if anything else happened. The target made a couple more short moves then left our radar coverage in a northerly direction - speed still about 600 MPH. We lost target outbound to the north at about 50 to 60 miles which is normal if aircraft or target is at an altitude below 5,000 feet - (because of the radiation lobe of that type radar). We notified 7th AD Command Post + they said they'de tell everybody for us. I made out a written report on all this, in detail for the Officer in Charge of my facility and was told that unless I was contacted later for any further information, he would take care of it. I don't know if a CERVIS report was submitted on this or not - I heard no more about it. All speeds in this report were calculated speeds based on time + distance covered on radar. This speed was calculated many times that evening and altho this happened quite a while ago -the basic elements are correct. Hope this helps in some small way to assist in your UFO investigations.